In the early days, WordPress earned it’s fame by showcasing the power of “democratizing publishing” by putting the power of content into the hands of you and me, rather than only news agencies or corporations. One way they showcased that power was with the “Blogroll”. The Blogroll was powered by the Links Manager, Links Menu, and Links Widget. This was how you could add all your friends’ blogs as a hyperlink from your blog. There were vast Blogroll networks. Some were very elite and difficult to join. You had to know the right people and pay the right price to get added to some of these elite lists. The result was a long… LONG list of links in everyone’s sidebar that linked to hundreds of other sites. This was how you were discovered. But this trend piggy-backed off the somewhat shady SEO practice of keyword stuffing, or link stuffing your content in order for the search engines to find you and consider your page relevant. WordPress retired the Link Manager from Core back in February 2013 (though you can still install it as a plugin). Since then WordPress users have relied primarily on good-old-fashioned content creation and SEO best practices. While no one really misses the Blogroll at all, it served a purpose that hasn’t really been filled well since then. That being, sharing content between WordPress websites and blogs is not as seamless or dramatic as it used to be. Of course, WordPress.com and Jetpack users have the “Reblog” tool, and self-hosted sites have sharing tools, but showcasing someone else’s content on your site has been a missing element for quite some time. In the meantime, we’ve seen a rise in publishing platforms like Medium who blur the lines between unique content and their platform. Social media giants Twitter and Facebook have also been revolutionizing the way content is previewed on their platforms and shared throughout the web. Syed Balki recently reviewed Facebook’s revamped “Notes” feature and predicts it to be a significant boon for Facebook and sharing content in general. All of these new advances have one very specific intention: Content. Whether it’s Medium, Twitter, or Facebook, each of them want to own your content. They want you to share your content on their platform and now even read your content on their platform. Have you noticed how when you click on a link on your phone in Facebook you never actually leave Facebook? Your readers are reading your content through Facebook, or through Twitter. As Syed hinted at in his article, it’s likely that they are planning to take that one step further. Soon, your content that is shared on their platform will be available directly on the platform so that your readers won’t even have to go to your website to read your content. In some ways that might seem beneficial. Social Media definitely is a medium for amplifying your potential online reach. But at what expense? Isn’t it best to have your visitors come to your website and have the full experience of your website that you’ve spent time and money on? To me, this is a gorgeous way to share content on your WordPress site and drive more traffic. I’d love to see WordImpress posts shared all over the web in this format. It’s clean and grabs your attention and is useful. [NOTE:] This is a feature candidate for inclusion in WordPress Core version 4.4. The team behind it will find out tomorrow (Oct. 6) if it will get included or not. I’ll update the post with any relevant news. [UPDATE:] This feature has been officially merged into Core and slated for WordPress 4.4 which is scheduled to be released in December. Of course, this could easily be used to share your own content, and you’re not going to want to share EVERY link that way. Part of the power of this feature is how easily “skinnable” it is. Theme authors are going to want to pay attention to it’s templating feature, and plugin authors might want to leverage it’s hooks to selectively enable/disable elements of the output. Either way, this is shaping up to be a great new feature to look forward to. Crossing our fingers it gets accepted for version 4.4 due in December 2015. If you want to start sharing posts like this now, or you want to help contribute to a plugin that has a really good chance of getting adopted into Core, here’s a few resources. Install the plugin on your site now. Read the Announcement Post about this as a potential Feature for Core. Shameless plug for your plugin, huh? No worries. Looks nice. The difference is that when this is included in Core it’s then available for MILLIONS of websites overnight which will change the way content is shared in WordPress. I see some other differences. For one, with Content Cards, you do not depend on the external website having enabled oEmbed endpoint. Most modern websites already have OpenGraph data in place for social sharing, so you can embed almost any website, not jst other WordPress sites. Another thing – oEmbeds are loaded via iframes, so if the remote site has difficulties, your posts might break too, or take a lot of time to load. Or, being a popular site, you could break the site you are trying to share (Reddit effect). If oEmbed endpoints will be enabled for every site, by default, I foresee quite a lot of trouble here. Content Cards cache all data and only pings the remote site for update once in a while, so you have speed benefits and you are not a menace to small sites. 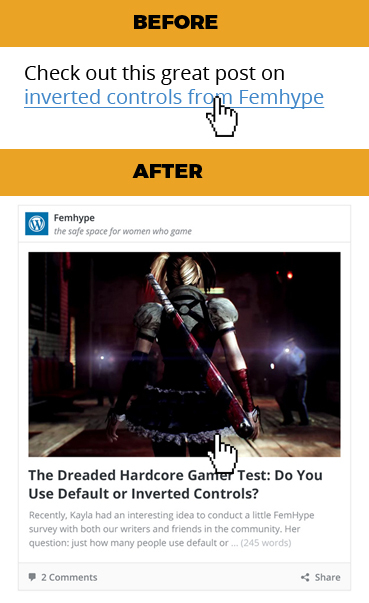 Third – with oEmbeds, the site that is being embeded has full control of appearance of the embed. And it can even change stuff after you have embeded them. With Content Cards, you have full control over the appearance and can make embeds part of your website, and also consistent visually. Notice the descriptions which I believe address most of your concerns regarding security and presentation. 1) oEmbed provider is enabled by default and there is no simple (i.e. UI based) way to switch it off. 2) Content is embeded via iframe, so provider sites will be hit by huge traffic if their link is embeded in a popular site. 3) The content and appearance of embed is controlled by the provider site. 1) Adding an option in the UI for a new core feature would go against the “decisions, not options” mantra. Only a small part of users will ever want to disable this, having an option only for them is unnecessary. 2) In such a case t’s up to the source site to install an appropriate caching plugin. 3) There are arguments for either way. 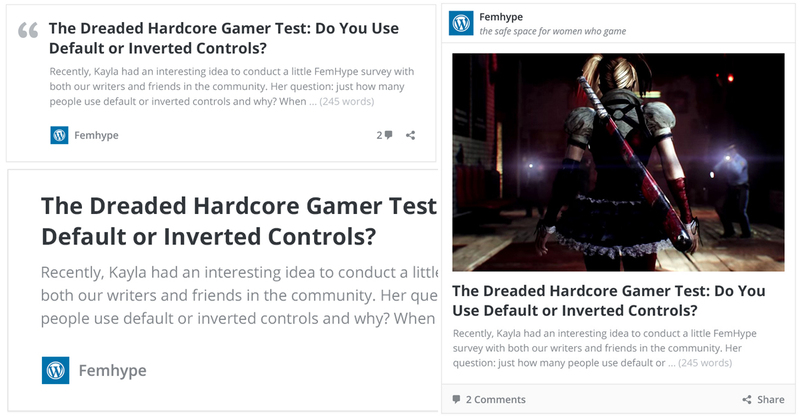 In my opinion WordPress should give users the control over their content. Long story short, the new oEmbed feature and your plugin are both valid use cases. If you think otherwise, you can always suggest it as a feature plugin. I am not trying to say oEmbed is bad. But I think it might (and probably will) cause a bit of trouble for some unlucky small sites. In a perfect world everybody has caching and a plan to deal with traffic spikes, but in reality, the small sites (and there are tons of them), the ones that are the most in danger being taken down by a ‘drive-by embed’ are the ones that will not have those things and the known how to deal with that stuff. But thats the cost of progress, I guess. We learned how to deal with Digg effect, Reddit effect, now we’ll need to deal with oEmbed effect 🙂 I saw you had a small plugin made to turn this off. I really suggest this should be at least mentioned as a solution for such situations.